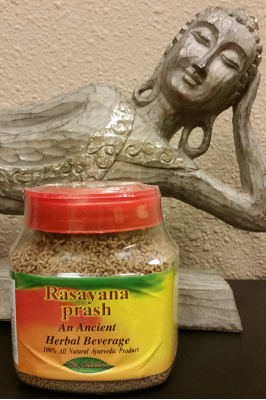 In Ayurvedic tradition, rejuvenating herbs are called “Rasayana”. They contain micro-nutrients which improve health, immunity, vigor, vitality and promote longevity and help protect against stress. Rasayana prash tea was developed Dr. Kotecha, founder of the Chakraprani Ayurveda Clinic & Research Center, through years of research and a desire to provide a safe reliable herbal tonic to promote sustainable health and longevity for people suffering from stress and exposure to pollution and toxins that have become a part of modern life. Useful as an adjunct to minimize side effects of modern medicines while increasing bio-availability of these drugs. About the ingredients: Shatavari promotes and optimizes strength of tissues and enhances general immunity to help prevent onset of diseases. Ashwagandha is a known immuno-promoter herb. Arjuna is a cardiac tonic and blood pressure modulator while Pippli modulates the function of spleen and strengthens the respiratory system. Manjishtha is a blood purifier and Gokshur helps fight aging of tissues and is also a potent help for dysuria. Sariva promotes optimal growth of tissues and fights against strength-loss, Cinnamon and Cardamon are both potency providers with natural volatile oils. All of the herbs used in this tea are known antioxidants. The formulation is supplied in the form of granules that also contain natural cane sugar Q.S. which makes a delicious drink when mixed with hot or cold water, milk, tea or coffee.